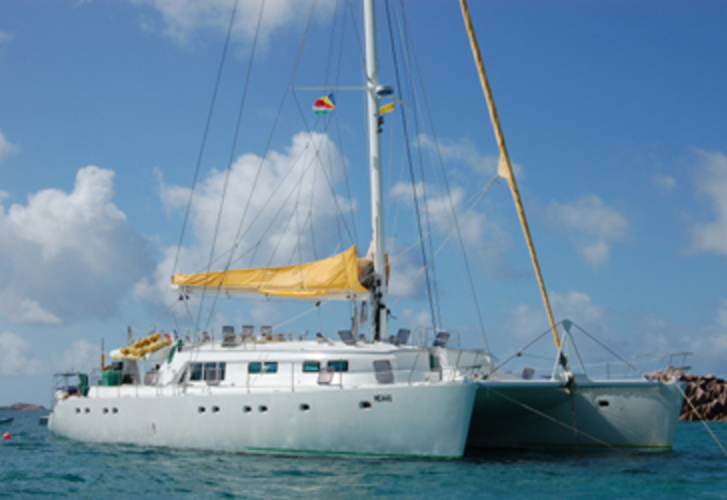 Sailboat Mojito 82 called DREAM SEYCHELLES was produced in 2006. DREAM SEYCHELLES is licensed for 24 crew members. Layout of the sailboat is 24. Mojito 82 DREAM SEYCHELLES has 12 cabins. For comfort of passengers there are 4 WC. You can fill the tank for fuel with 480 L liters and in water container it goes even 700 L l. With engine 2 x 55 hp DREAM SEYCHELLES can sail really fast. DREAM SEYCHELLES is 14.30 m long and 7.70 meters wide. Depth is 1.10 m. Yacht's equipment involves : Mainsail with lazy jack, Bimini top, Anchor electric windlass, Dinghy, Autopilot, Radar, Radio / cd player, Inverter 12v-220v. . Nonrefundable deposit is 0.00 EUR. Choose our offer and spend great time on the deck of DREAM SEYCHELLES.